Radhika Jones hasn’t exactly pulled out all the stops since taking over for Graydon Carter at Vanity Fair, and even covers featuring the likes of Jennifer Lawrence, Michelle Williams or Natalie Portman haven’t managed to impress our discerning forum members. Jones, however, is sticking to tradition as the magazine drops its 25th annual ‘Hollywood Issue‘ for 2019. Chadwick Boseman, Saoirse Ronan, Timothée Chalamet, Nicholas Hoult, Yalitza Aparicio, Rami Malek, Regina King, John David Washington, Elizabeth Debicki, Tessa Thompson and Henry Golding get the honors this year, styled by Samira Nasr and photographed by Emmanuel Lubezki, who makes for a refreshing alternative to Annie Leibovitz (especially considering last year’s unforgivable Photoshop blunder). Worth noting is that the cover features a majority people of color for the first time. Despite the diverse cover subjects, don’t expect our forum members to make a mad dash to the newsstand. “This cover is standard. Nothing feels special. All the poses seems so calculated and forced,” commented TaylorBinque. “This looks like a bunch of extremely bored people on a film set who have been waiting hours for their call to work,” tigerrouge chimed in. “Tiresome. Same boring, pretentious group portrait. Where are the obnoxious Photoshop bloopers?” mocked dfl-001. “I have never heard of most of the people here (my fault, not theirs), and can’t help but feel this was a bit forced,” Srdjan complained. In agreement over the casting was forum member Karl Boucher. “WTF, where is Glenn Close, Lady Gaga, Olivia Colman?” he asked. “I feel that with this lineup, the cover would’ve been a bit more relevant a year ago,” disapproved mikel. If the same old-same old poses on the cover aren’t doing it for you. 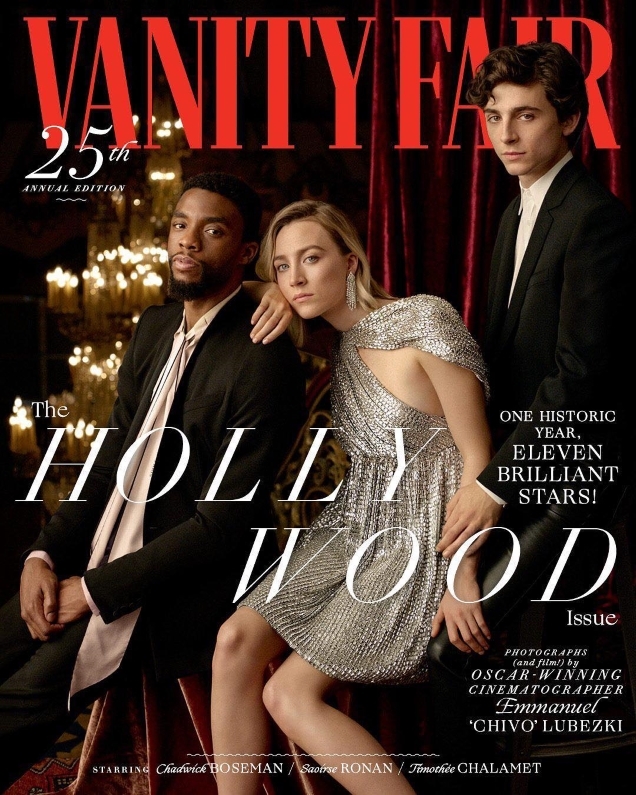 Check out Vanity Fair’s Instagram for some livelier shots, including behind-the-scenes images, smoldering short videos featuring Boseman and Chalamet, and a whole lot of dancing. “It feels like a movie set,” said Timothée Chalamet at the 25th Vanity Fair Hollywood cover shoot—and he wasn’t wrong. With the help of Oscar-winning cinematographer Emmanuel “Chivo” Lubezki (@chivexp), we threw a two-day fête at the historic Los Angeles Theatre to rival the likes of Federico Fellini. Fortunately, @LandonNordeman was there to photograph all the behind-the-scenes magic, which you can see in full at the link in bio. “It’s a pinch-me moment,” says Timothée Chalamet of being on the cover of V.F.’s 25th anniversary Hollywood Issue. We enlisted three-time Oscar-winning cinematographer Emmanuel “Chivo” Lubezki to shoot the momentous occasion—see the entire portfolio at the link in bio. Styled by @SamiraNasr.